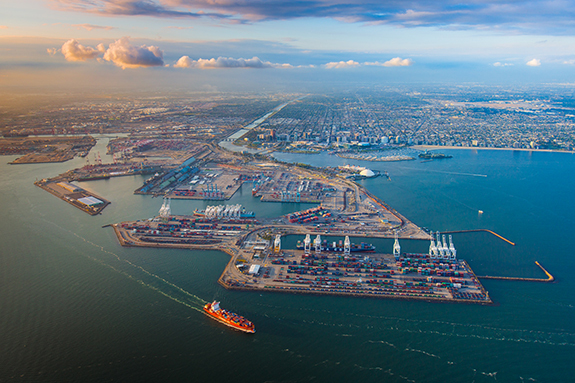 The Port of Long Beach has received preliminary approval for a USD 50 million grant from the California Air Resources Board for a sweeping, transformative demonstration of a near-zero and zero-emissions supply chain at the nation’s second-busiest seaport. The California Air Resources Board (CARB) has preliminarily awarded the grant for the Sustainable Terminals Accelerating Regional Transformation (START) Project. The START Project will demonstrate nearly 100 pieces of zero-emissions terminal equipment and trucks at three California seaports, develop a near-zero emissions tugboat, deploy two of the cleanest ships to ever to call the West Coast, and advance workforce development programs to support sustainable goods movement. The START Project is part of California Climate Investments, a statewide initiative that puts billions of Cap-and-Trade dollars to work reducing greenhouse gas emissions, strengthening the economy and improving public health and the environment — particularly in disadvantaged communities. Long Beach equipment funded by START includes 33 zero-emissions yard tractors and one top handler at Pier C — one of the nation’s largest deployments of zero-emissions equipment at a single terminal; five electric trucks at Shippers Transport; two charging outlets at the Clean Trucks Program Center, which will be the first publicly accessible heavy-duty truck charging outlets in Southern California; two Matson container ships with Tier 3 engines, which will be the cleanest container ships to call the West Coast; and Harley Marine electric-drive tugboats. As part of the project, the Port of Long Beach will demonstrate a full near-zero/zero emissions supply chain. In operation, this means a ship — one of the cleanest in the world — would be brought to SSA Marine Pier C by an electric-drive tugboat, and then plug into shore power rather than run the vessel’s engines for power needs while docked. Then, the cargo containers on the ship would be handled by zero-emissions, battery-electric yard tractors and top handler cargo-handling equipment before being transported on a zero-emissions electric truck to Shippers Transport, an off-dock container yard. Among others, project partners include the Ports of Oakland and Stockton, SSA Marine, Matson Navigation Co., Shippers Transport, the Long Beach Unified School District and Long Beach City College. The Port of Long Beach was the lead applicant for the award. Additionally, Port staff will also work with LBCC and LBUSD to share their port-related education and workforce programs with school districts and community colleges in Oakland and Stockton. The project will be completed by June 2021 and includes USD 52 million in matching funds from private and public partners for a total cost of USD 102 million.